I found this idea and decided to try it out. 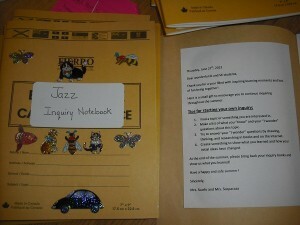 Each student created a little notebook that they decorated and I placed an inquiry letter inside. 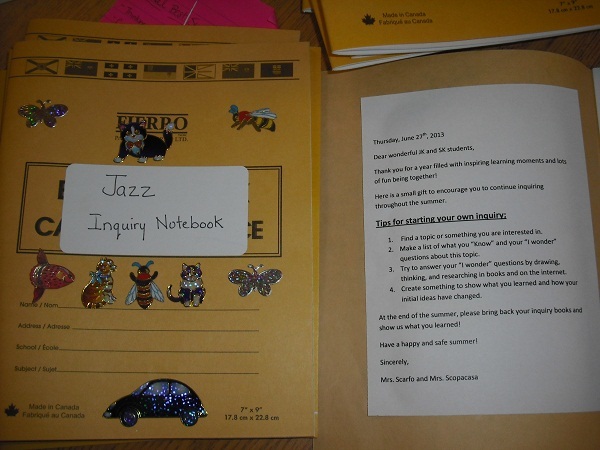 This letter outlines 4 easy steps on how to start your own inquiry over the summer. We also discussed ideas, how to use the book, and places they may want to store it so it does not get lost! I asked that they share their discoveries with us in September! Different boards have different plans on how to introduce the new JK students into the classroom setting. Some have individual meetings with the child and parent(s) scheduledwithin the first 2 weeks and then they begin as a large group by the 3rd week of September. Last year I had a straight JK class so we had groups of children of about 3-5 come to school with their parents on a scheduled morning. As the children played, we discussed with parents our classroom routines, bookbags, notes and newsletters, snack/lunch, indoor shoes, busing, starting and ending times, pick-up policy etc. Basically, everything we included in our JK handbook was reviewed with parents. Parents also appreciated this time because they were able to ask questions, hear others ideas/concerns/questions and meet other parents in a small, intimate setting and children met a few friends before they arrived on the very first day. We had a school tour, we assigned them their locker space, walked through where buses drop off and how/where they would enter into our classroom etc. This year with a JK/SK split our plan so far is to have the SKs come the first weeks with no JKs present so that we can reacquaintthem with rules, routines and get them comfortable. Then start having the JK students coming the following week in small groups of (3-5) for an hour with their parents. SKs will be in centres as we discuss/talk to parents. To change from the sand in our sensory table and to add something new, today we had “snow” in our kindergarten room. We filled a large tub with cottonballs. I sprinkled a little bit of silver glitter on the cottonballs to make it sparkle like snow. We added small mittens, pine needles, pine cones and small shovels. You could also use rice, shredded paper, shaving cream, flour, instant snow, fake snow from a dollar store, or instant mashed potatoe mix. Or, you could use each of these on different days to keep the children’s interest. It is a very simple and easy activity that the children loved. It also brought some of the students’ interest back to sensory who usually do not play in sand or water. Although the purpose of the blog is to identify the thousands of moments of learning that can be observed in a play-based kindergarten program, I think it is important to devote one blog entry to our experience in setting up a new classroom for full day learning. I had been storing all the classroom materials I had acquired over the past five years at my old school and managed to move with the help of a willing partner who owns a pick up. (very handy!) Before unloading the material I thought it would be wise to check the new space first. It was empty – completely empty! The material that had been ordered for the new room had not yet arrived. I had not materials for a drama centre, a sand or water centre, an easel or paint brushes, big blocks … I contacted my new partner Natalee who has been working in a child care centre and had just been hired as the Designated Early Childhood Educator in the Early Learning Kindergarten team. She was even more amazed to see our empty room. Items had been ordered but most of them would not arrive prior to the first day of school. We worked hard at making the room enticing to the children since we knew that for many of our students, this was their first experience with leaving home and going into a new setting on their own and the experience had to be a positive one. We also had to make sure that we had a variety of activities available for children, even though most of our basic furniture and material was not yet delivered. It ended up being a good opportunity for us to get to know each other and to have a very authentic opportunity to talk pedagogy prior to the first day of school. This week we had parent observation visits. We tried to have 5 parents in the morning for an hour from 9:30 to 10:30 and 5 in the afternoon from 1:30 to 2:30. It took 3 days but now they are all done and we are getting ready for the parent interviews. We both thought the observations went very well. The parents really enjoyed watching their children play and enjoyed playing with them. Shan and I spent a lot of time explaining what the children were learning at the various activities so that they could have a deeper understanding of our program. The class seemed very full and busy during these parent observations but it all ran smoothly. Shan and I felt so confident about our classroom and how every child was engaged in something very constructive through open-ended materials. The way we set the room up together was amazing and we feel we have set up an amazing space for learning. To see it working so well every day makes us feel so good. The children are loving it and the parents are understanding it. The children had learned a song called “I’m A Little Snowman” sung to the tune of “I’m A Little Teapot”. They thought it was fun to change the words and they talked about how simple it was to write a song this way. Vanessa suggested that the students might like to write their own songs when they went to the centres. One little girl went straight to the writing centre and enthusiastically started to create her own song. Her idea quickly caught on, with many other students writing their own original songs which they continued to sing to the tune of “I’m A Little Teapot.” Two of the students very proudly read and sang their song for me. It is so easy to use these authentic writing opportunities to gain valuable assessment data on these children. Because it is their choice to write these words they are working in their individual zones of proximal development and truly demonstrating their understanding of the writing process. Other children will demonstrate their knowledge in different ways, at different times, and around different topics but information can be gathered in this way on all students. Sean came over to me with a salad bowl and a large salad spoon, pretending to be stirring something in the bowl. He returned to the home centre and put it in a cupboard. The Home Centre was set up as a doctor’s office. Consider how the children are using the props offered them for their play. A little girl approached me and asked me to help her and a friend put on large white shirts because they were both going to be doctors. Another student is laying on a mat on the floor covered with a blanket and holding a doll. S- “I’m writing her name and I’m writing the appointment” (She has organized several columns on the paper) She puts the clipboard down and touches the doll’s face. S- “Now I’m checking the baby too” She pretends to put something in the doll’s mouth.